Percy Bysshe Shelley, perhaps one of the greatest poets of the English language, universally admired by students of literature, a revolutionary mind in literature and philosophy and college drop out. Okay, that is not entirely correct. He was actually expelled. Yes, expelled. That guy that you were required to study by your senior year English teacher and whom your Literature 201 professor went on about for days was actually expelled from Oxford. Now the Romantic poets were not exactly known for being good little boys and girls, and most of Byron’s poor behavior came in the form of romantic conquests and there was also the all too common descent into penury and debt that plagued them all at one time or another. But no, not Shelley. He had done something entirely unacceptable, something so scandalous it would cause his father to stop speaking to him (although in honesty, it was one of several occasions where his father refused to speak to him so take that as you will). What was this heinous crime? What terrible transgression did he commit? He wrote a paper. Yes, just a paper. Well, technically it was a pamphlet. It was 13 pages on a topic that would be none too popular today either. The pamphlet was titled “The Necessity of Atheism” and its author was listed only as “Thro’ deficiency of proof, an atheist.” Shelley never did actually cop to writing it, but it is believed that he and a friend named Thomas Jefferson Hogg wrote and published it in small numbers in the late winter of 1811. They both had talked it up amongst their fellows at Oxford and made sure copies were disseminated far and wide, going as far as to mail them to the bishops, professors and heads of the college. This was probably a bit too much cheek for the Oxford Dons. The pamphlet itself was actually very blasé. It can be summed up quickly as saying due to a lack of empirical evidence of G_d’s existence; it is safer to be an atheist. It is not the very strong argument of a died in the wool zealot, nor was it actually written very well. It was, however, enough to bring him before a disciplinary committee. Some believe that it was helped by another of Shelley’s publications from that year, a poem called “A Poetical Essay on the Existing State of Things” that Shelley had published alone as a Gentleman of the University of Oxford, that made a great outcry against the Napoleonic Wars that were nearing an end at that time. Whatever the reason turned out to be, when Shelley refused to confirm or deny his authorship of either works he was expelled. Hogg met the same fate. Sir Timothy Shelley felt no sorrow for his son. His own copy of “The Necessity of Atheism” has the word “impious” scrawled across it. In fact, the Baronet went to see his son and in the presence of the aforementioned Hogg raved, cursed and cried at his son, finally insisting that Percy return home to be educate by teachers Sir Timothy would choose. This began a rift that would eventually keep the two from speaking to each other for years and damaged their relationship in ways that were never to be mended. To many modern Americans, “The Necessity of Atheism” and “A Poetical Essay” are just a bit of youthful rebellion, common to people in their late teens. They would have been articles in your school’s underground newspaper twenty or forty years ago. Today they would be blog posts from online aliases or facebooks status updates. Your parents might not approve, but nothing that would warrant expulsion and being disowned. Shelley held to his beliefs and rarely compromised them. He never abandoned them wholly, but only modified them as his life brought him greater scope of experience. In an ironic twist, these two pamphlets as well as Shelley’s letter to his father are all part of the collection of the Bodleian Library and are part of a travelling collection called Shelley’s Ghost. In fact a copy of “A Poetical Essay on the Existing State of Things”, once thought lost to the world was added at some expense to the library’s collection as the 12 millionth items in 2006. The Bodleian is the much celebrated research library of Oxford University and the second largest repository in Britain. 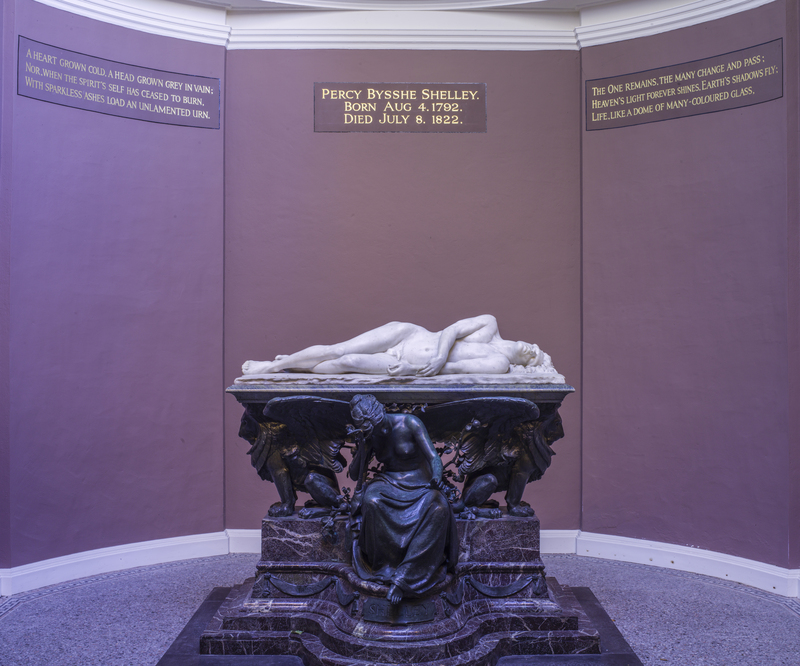 If you go to see it you can also take in the rather grand memorial to Shelley placed on Oxford’s campus, a place too noble to accept him in life and only too willing to lionize him, deservedly so, in death. Early on an English summer morning more than two centuries years ago, a young girl ran away with an obscure poet and the two fled to France. She was seventeen years old. He was twenty-two and left behind a pregnant wife and a child. Depending on how you look at it, this was either the beginning of a sordid affair or the very stuff of romance. Either way, there’s much more to the story. The young man, Percy Bysshe Shelley, was a literary genius and became a celebrated Romantic poet. 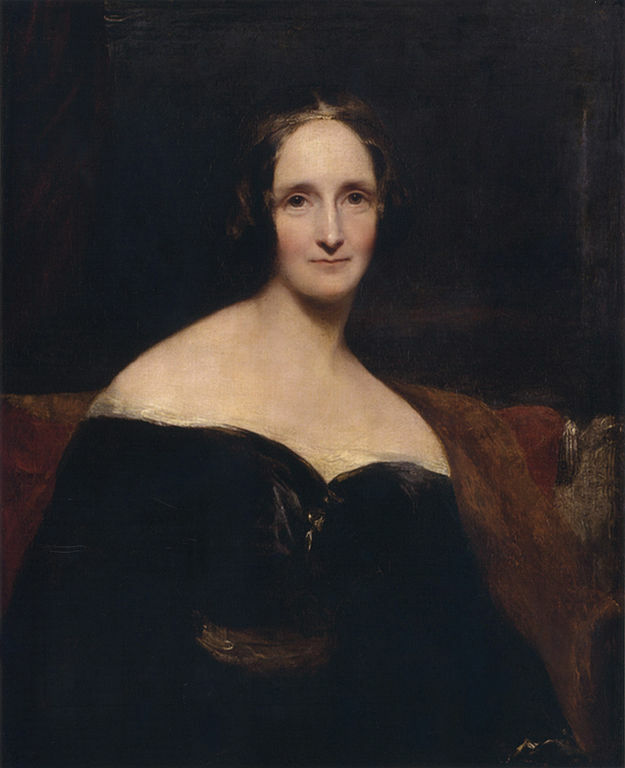 His lover, Mary Godwin, wrote Frankenstein, one of the most famous novels of all time. Today’s date, July 28, marks the 201st anniversary of their elopement in 1814 and the beginning of their tumultuous life together. 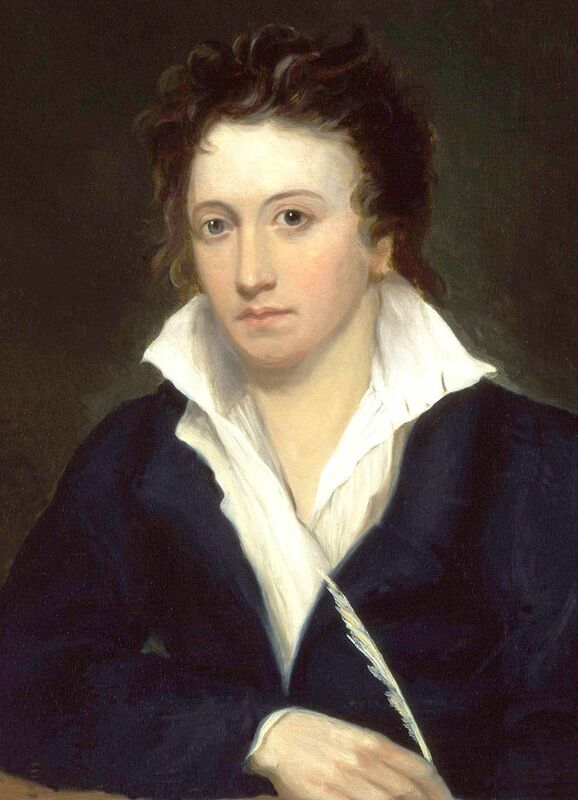 Percy Bysshe Shelley was born into an aristocratic family on September 4, 1792. Percy enjoyed a life of privilege and was sent to Eton College when he was twelve. After six years at Eton, where he became known for his anti-authoritarian views and began writing poetry and prose, he entered Oxford University in 1810. At Oxford he and a friend, Thomas Jefferson Hogg, influenced each other’s growing rejection of societal rules. Their collaboration on a pamphlet titled The Necessity of Atheism resulted in their expulsion from Oxford. Percy’s father, angered by his expulsion and refusal to renounce the pamphlet’s atheist ideas, cut him off financially until he came of age two years later. While living in poverty, Percy eloped with sixteen-year-old Harriet Westbrook. Mary Wollstonecraft Godwin’s childhood has elements of “Cinderella,” complete with a malevolent stepmother. Mary was the child of two renowned freethinkers – reformer and feminist Mary Wollstonecraft (the author of A Vindication of the Rights of Women), and William Godwin, noted writer, philosopher, and atheist. Mary Wollstonecraft died days after Mary’s birth on August 30, 1797. William then married Mary Jane Clairmont, a widow with two young children. The new Mrs. Godwin favored her children over Mary and was jealous of William’s attention to her. She made life difficult for Mary and promoted her children’s education at the expense of Mary’s. Despite Mrs. Godwin’s efforts, Mary received an excellent education. She had access to her father’s library, listened to his discussions with other leading intellectuals, and immersed herself in her late mother’s writings. Due to clashes with her stepmother, Mary was sent to live with the Baxter family in Scotland. Here she finally found a loving family, and began to focus on her writing. On a visit home in 1812, fifteen-year-old Mary met Percy Shelley, an admirer of her father. Percy visited the Godwin home often and became friendly with Mary, whom he recognized as an intellectual soulmate. Percy resented that his wife Harriet, preoccupied with one child and pregnant with another, no longer made him the center of attention. In 1814, Mary and Percy met again, began spending time together, and fell in love. William Godwin forbade the relationship and Mary promised not to see Percy. But after Percy threatened to commit suicide, she agreed to flee to France with him. Mary’s stepsister, Jane Claire Clairmont, accompanied them. Mary’s stepmother followed in hot pursuit to try to stop the elopement. She caught up with the three at the French port of Calais, but couldn’t persuade them to return with her. When the two lovers ran out of money and returned to England, William Godwin wouldn’t see them, and didn’t speak to Mary for almost four years. 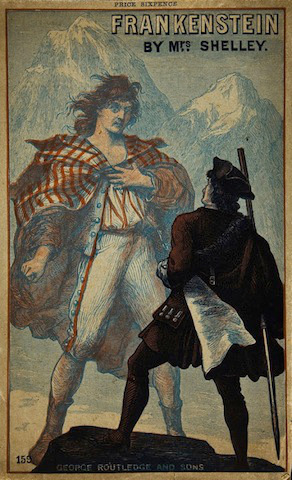 Percy’s father, angered by his son’s abandonment of Harriet, cut off his allowance, and Percy had to spend months on the run to avoid creditors. The couple experienced ups and downs over the next few years. In 1815, Mary was devastated by the death of her premature infant. Their finances improved when Percy received money after his grandfather died. In early 1816, Mary gave birth to their second child, William. A few months later, the couple visited Lord Byron and Mary’s stepsister Jane Claire Clairmont (Byron’s lover at the time) in Switzerland. One rainy afternoon, Byron suggested that his guests each write a ghost story. Only nineteen-year-old Mary finished her story, which eventually became the novel Frankenstein. In Mary’s novel, scientist Victor Frankenstein animates a creature from dismembered corpses. The enormous gentle but hideous creature is rejected and abandoned by Frankenstein. As the creature fails to find the love and companionship it craves, it becomes violent and brutal. Published anonymously in 1818 with a preface by Percy, it became one of the most popular works of the Romantic period. Percy and Mary returned to England in 1816 to face back-to-back tragedies. Mary’s half-sister committed suicide and a few weeks later, Percy’s wife Harriet killed herself. Harriet’s death allowed Percy and Mary to wed. Percy’s efforts to gain custody of his two children with Harriet were blocked by her family’s claims that his poetry (especially free love and atheism promoted in the political epic Queen Mab) showed him to be an unfit parent. In March of 1818, the Shelleys settled in Italy, where Percy became part of an expatriate artistic community centered on Lord Byron. There Percy wrote some of his best work – Prometheus Unbound, “Ode to the West Wind,” “The Cloud, “To a Skylark,” and “Ode to Liberty.” Sadly, their two children, William and Clara, died a year apart, in 1818 and 1819. Mary gave birth to a son, Percy Florence, in November 1819. By 1822, the Shelleys had settled on the Bay of San Terenzo in Italy. They were joined by Edward Williams and his wife, Jane. Percy, disappointed in his marriage, began a flirtation with Jane and wrote several poems to her. In June, Mary almost died after the miscarriage of her fifth child. In July, shortly before Percy’s thirtieth birthday, he and Edward Williams drowned when their boat sank in a storm. Mary devoted herself to caring for Percy Florence, the only one of her five children to reach adulthood. She was also dedicated to maintaining her husband’s literary legacy. She collected and edited Percy’s poetry and wrote his biography. She continued to write the rest of her life, and was able to provide Percy Florence with an excellent education at Harrow and Cambridge University. Mary died of a brain tumor in February of 1851.